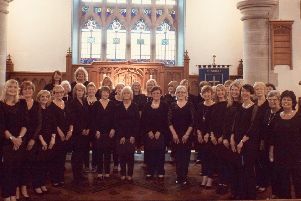 The Larne branch of the Disabled Christian Fellowship will be holding a fundraising concert on Saturday evening (March 24) in First Larne Presbyterian Church Hall, starting at 7.30 pm. During the evening, visitors will be able to hear more about the work of the DCF, enjoy an evening of gospel singing by some of Northern Ireland’s best-known gospel music artists and contribute towards the group’s work amongst disabled people in the community. Participating artists include family group The Morrisons, Lynda Lindsay and Nigel Davidson. The Larne branch of the Disabled Christian Fellowship is one of 21 branches throughout Northern Ireland. Approximately 50 people with various levels of both mental and physical disabilities attend the local meeting each month. This takes place at Gloucester Park Day Centre on the third Saturday of each month at 2.00 pm. The DCF is a compassionate ministry offering some practical support and spiritual and pastoral care. The branch is dependent on donations for support. A spokesperson said: “We provide a relaxed Christian environment for people who have various physical disabilities, visual or sensory impairment and mild learning difficulties to engage in worship, prayer and praise. The group seeks to offer spiritual and practical support and is keen to make each individual feel important and included during the year sharing “fun, food and fellowship”. There will be no admission charge to the concert although there will be an offering towards Larne Disabled Fellowship. A light supper will be provided.